The word “kumupa’a” means “To be built on a strong foundation of the past”. The Moku O Keawe Festival and Competition is the only international competition requiring performances in both Kahiko (ancient) and Auana (modern) styles. Great attention is paid, not only to beauty, skill and grace, but to language and interpretation. It is a strong foundation upon which the culture of hula will continue to grow. 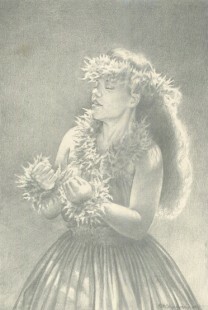 In 2007 the first Moku O Keawe International Hula Festival was held on the Island of Hawaii. Kumu Nalani Kanakaole, Kumu Nani Lim Yap, Sig Zane, Margo Mau Bunnel, my husband Bertil and I agreed on the need for deeper foundational education in hula culture as hula was being embraced globally by hundreds of thousands of people. Noted designer and Advisor to the MOK Foundation, Sig Zane, designed the logo for the Festival and I have done the festival posters each year. This image was used for 2008. 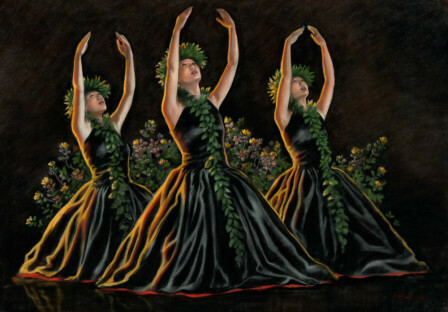 The three dancers represent the three volcano’s on Moku o Keawe (the Big Island) in which who’s presence the Moku O Keawe Festival is preformed. These are Mauna Kea, Mauna Loa and Hualalai. During a group of dancers performance in 2007, I was struck by their beautiful dresses of black satin and how much they looked like the black lava that makes up our Island. Their underskirts of red helped to create the feeling of the creative fire that lives not only within the dancers, but also within the Big Island. The word “kumupa’a” means “To be built on a strong foundation of the past”. 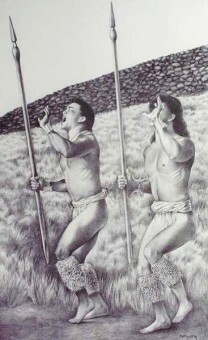 The MOK Festival and Competition is the only international competition requiring performances in both Kahiko (ancient) and Auana (modern) styles. Great attention is paid, not only to beauty, skill and grace, but to language and interpretation. It is a strong foundation upon which the culture of hula will continue to grow.